The SdKfz 251 (Sonderkraftfahrzeug 251) half-track was an armored fighting vehicle designed and first built by the Hanomag Company during World War II. Used by the Wehrmacht, the SdKfz 251 was designed to transport the panzergrenadiers of the German mechanized infantry corps into battle. SdKfz 251s were the most widely produced German half-tracks of the war, with at least 15,252 vehicles and variants produced by various manufacturers, and were commonly referred to simply as “Hanomags” by both German and Allied soldiers. There were four main model modifications (Ausführung A through D), which formed the basis for at least 22 variants. The initial idea was for a vehicle that could be used to transport a single squad of panzergrenadiers to the battlefield protected from enemy small arms fire, and with some protection from artillery fire. In addition, the standard mounting of at least one MG34 or MG42 machine gun allowed the vehicle to provide support by fire for the infantry squad once they had disembarked in battle. Variants were produced for specialized purposes, including with anti-aircraft guns, light howitzers, anti-tank guns and mortars or even large unguided artillery rockets. From early 1943, the D model was developed with the purpose of halving the number of angled body plates, simplifying the design and thus speeding up the production. D models can be easily recognized by their single piece sloping rear (with flat doors). 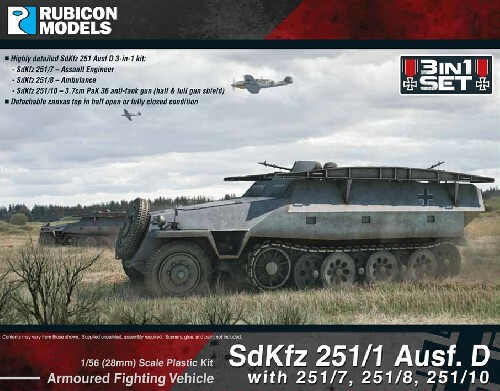 This highly detailed SdKfz 251 Ausf D is a 3-in-1 plastic kit. The kit can be built to represent a SdKfz 251/ 7 (Assault Engineering vehicle), SdKfz 251/8 (Ambulance), or SdKfz 251/10 (with 37mm PaK 36 anti-tank gun).